The powerful and versatile Brent EX is strong enough to handle 450 pounds of clay yet extremely quiet and smooth. The EX is AMACO’s most powerful Brent model ever built. The sturdy wheel can handle up to 450 pounds of clay continuously. It has electronic speed control, reversible for versatility, and assures maximum torque and a responsive control. The EX’s legs’ have a powder coating finish for enhanced strength, as well as enhanced scratch and corrosion resistance. The table is itself is constructed entirely of steel for a durable and rigid unit. The motor is a 1.5 horsepower, 15-amp DC unit with a permanent magnet, variable speed controls and uses a 4-groove, poly-v drive belt with automatic tensioning for unsurpassed performance when you need it. The engine maintains the proper torque at any speed with no vibrations and unparalleled stability. It uses filtered SCR technology that allows the motor to run quiet and will not interfere with the signal on AM or FM radios. On the Brent Classic control box, the toggle switches for turning the unit on and off and changing the rotation are easy to locate. The forward/reverse switch on the EX has a neutral position to avoid disruptions when you’re changing directions. The box has an indicator light that’s easy to see when you’re seated at the unit. 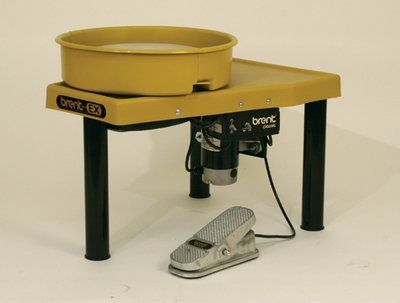 The wheel head on the Brent EX is 14 inches in diameter and has concentric circles that are useful when centering clay. The wheel comes with two bat pins. This model has an aluminum pedal with a 4-foot long cord. This highly durable pedal will rev up to 240 RPM smoothly for maximum control over your projects. Should you need to make out-of-warranty repairs, the EX’s easy-to-use modular connections on the foot pedal and motor will help make repairs a snap. With a purchase of the Brent EX, you will receive a free splash pan, a free Plast-i-Bat® (14 inches long) and a free instructional DVD “How to Throw on a Potter’s Wheel.” The Brent EX comes with a ten-year warranty, and you’ll also receive a $70 gift of Amaco® glazes with your purchase.